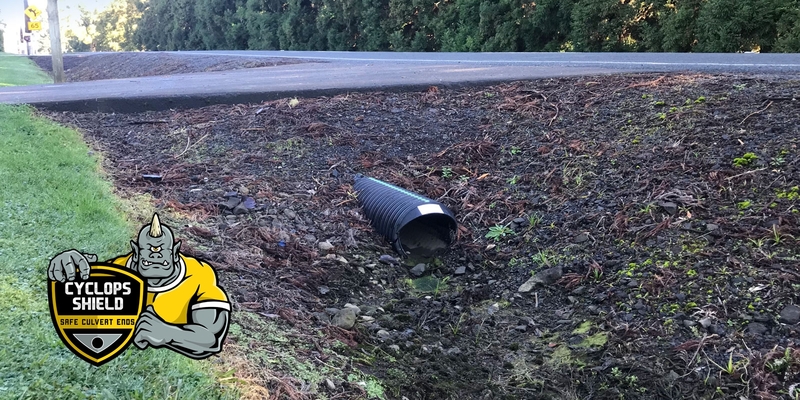 CyclopsShield safe culvert ends are a revolutionary new development launched by Safe Direction to lower the risk to motorists from exposed blunt end culverts. Blunt end culverts installed for drainage under access roads and driveways are a life endangering hazard to occupants of vehicles in runoff road accidents. The risk of impact with blunt end culverts is exacerbated by their location typically at the end of a parallel to road v-ditch drain that effectively funnels errant vehicles to a traumatic collision. It is anticipated that there are approximately 38 fatal crashes and over 380 serious crash incidents involving culvert end snags in Australia each year. Cyclops Shield is a simple extension to a concrete culvert that replaces concrete headwalls or blunt ends. The CyclopsShield end provides a deformable and traversable surface for an impacting vehicle permitting it to simply run up the embankement free of any violent impact. The effectiveness of CyclopsShield has been demonstrated through crash test validation with test impacts performed at 70km/h and 100km/h. In both instances the impacting vehicle rides up and over the culvert without snag. The Austroads Guide to Road Safety cautions that drains of both the abrupt and gradual slope design can funnel a vehicle along the drain bottom, and this increases the probability of impact with an object that has high-severity attributes. The most common of such obstruction is culvert ends. The reference goes on to advise that where drainage features are unavoidable that for drains parallel to the road (e.g.) under a driveway or side road) that a traversible culvert end treatment should be installed wherever a culvert exists. CyclopsShield is significantly lower cost than chamfered pre-cast concrete ends with traversable bars. Moreover, the absence of bars in the CyclopsShield solution makes it significantly less likely to catch debris causing blockage of the drain.